County Mayo, the third largest county in Ireland, lies on the western seaboard surrounded by the counties of Galway, Roscommon and Sligo. 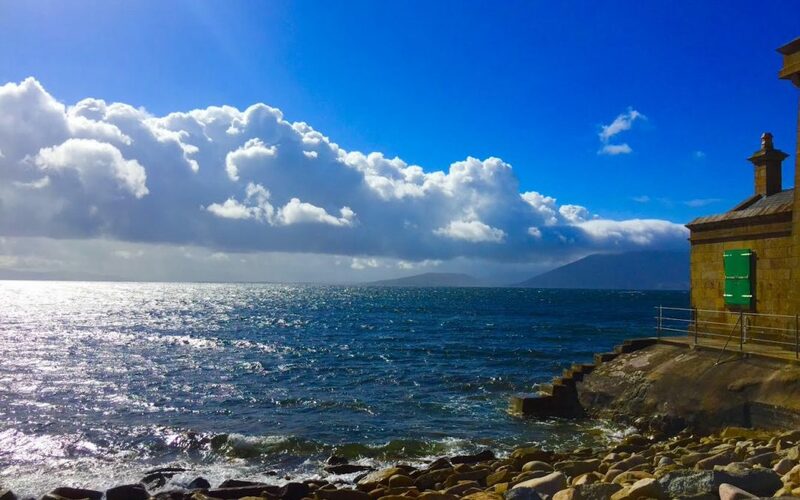 Having a good chunk of the Wild Atlantic Way on its western side, County Mayo has a long connection with the sea and reputably has one of Ireland’s best known pirates, Grainne O’Malley who terrorised many around Clew Bay. County Mayo has a population of 130,500 people. 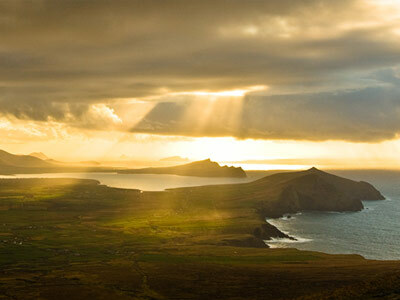 Mayo is one of those counties in Ireland which inspires enormous pride within its diaspora. This comes to the fore during major sporting occasions, like Gaelic Football. I personally have first knowledge of this from a fiercely proud Irish/American family I have been lucky to spend two extended tour periods with. Their pride in their County Mayo roots is impressive and they are fantastic ambassadors for Mayo in the USA. When it comes to scenery, history, culture and interesting places to visit, Mayo is not found wanting. 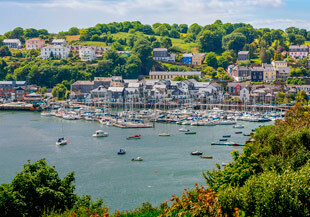 It’s coastline of course contributes significantly to the attractiveness of the county, but many inland parts of the county also have much to offer. The principal town in the county is Castlebar, but the population extends to many other nice towns including Westport, Ballynahinch, Claremorris, Ballinrobe, Ballyhaunis, Belmullet and Foxford. The county spreads out and several days would be required to explore it fully. 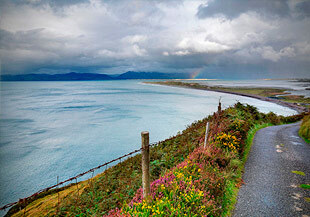 The county also has within its boundaries the two most important religious sites in Ireland, Croagh Patrick and Knock. (1). 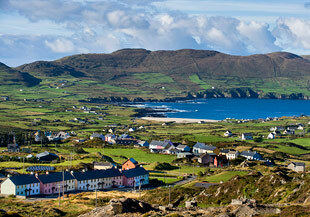 The Mullet Peninsula – situated in the north west of the county, this peninsula offers stunning Atlantic views. The view of across the bay towards Achill (see picture above) is top of the list as regards experiencing the Wild Atlantic Way at its best. (3) Westport – situated at the mouth of Clew Bay is a picture postcard town designed in the Georgian architectural style is without doubt one of Ireland’s prettiest towns. Created to service the needs of the aristocratic family residing in Westport House, the town has succeeded in maintains the style and atmosphere of an 18th century prosperous town. There is plenty of good quality accommodation to be found in Westport. (4) Croagh Patrick, situated west of Westport is Ireland’s holy mountain. 764 meters high, it is a pilgrimage site for Christians in Ireland, many of whom climb it barefoot. The views of Clew Bay as you climb this mountain are absolutely fantastic. 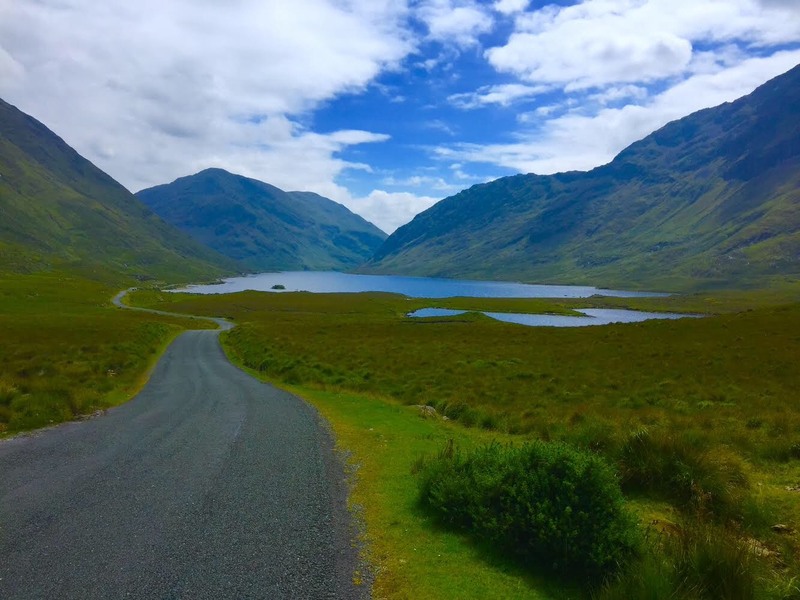 (5) The Doolough Valley, stunning inland lakes and mountains scenery, the drive through the Doolough Valley (pictured above) is not to be missed if touring in either County Mayo or County Galway. Situated between the villages of Louisburgh and Leenane, the drive through the valley is associated with a very sad story of events during Ireland’s Great Famine. The southern side of this valley gives you access to Connemara and attractions like Kylemore Abbey. (6) Irish Museum of Country Life – located east of Castlebar at Turlough this museum is well worth a visit. Within its walls it has succeeded in retaining and displaying exhibits and artifacts from the old Ireland, and is a vivid reminder of what life used to be .ime on this is Island. Admission is free. Several hours needed at this location. What is set out above is certainly not an exhaustive list, other attractions like Downpatrick Head and Ballintubber Abbey are equally impressive and worth a visit. Overall, you will certainly get value from stopping a while in County Mayo, and you will certainly add to your library of photographs worth keeping.